Members of the panel discussed the ways in which recent flooding has revealed the impact of climate change on Williamstown and the Berkshires. Photo courtesy of Rosa Kirk-Davidoff. In August 2011, tropical storm Irene struck Williamstown. The Hoosic River overflowed, flooding lower Cole Field. With over eight feet of floodwater, only the backboard used for soccer practice remained above water. Some students decided to bring out their kayaks. According to Bilal Ansari, assistant director of the Davis Center (DC), and Hank Art, director of the Center for Environmental Studies (CES), every home in the Spruces Mobile Home Park was ruled uninhabitable, and 226 residents were forced to find alternative housing. The immense flooding of 2011 was the starting point for a discussion on the intersections between climate change, community resilience and environmental justice at the College and the town. 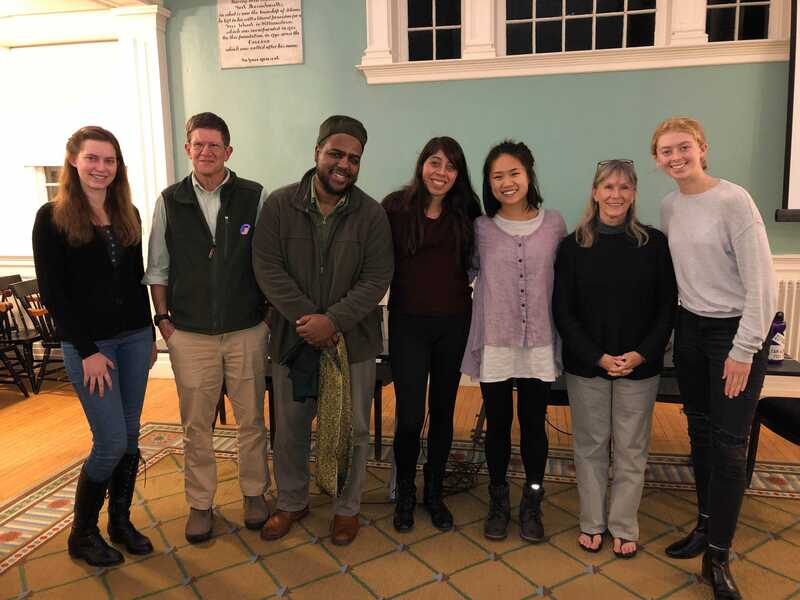 On Nov. 6, the Williams Environmental Council members Amber Lee ’21, Elizabeth Bigham ’21 and Maya Spalding-Fecher ’21 co-organized a panel that featured several voices from the local community: Senior Planner for the Berkshire Regional Planning Commission Lauren Gaherty, Ansari, Art and Jessica Muñoz ’19. Although Williamstown is a designated green community, with over 65 homes taking advantage of solar panels, there is still work to be done. To this end, the Adaptation Committee of the Zilkha Center and the Campus Environment Advisory Committee are looking into solutions to climate change. “We are here for four years, and it seems as though climate change will not affect us,” Muñoz said. “However, students who live on campus over the summer can speak to rising temperatures, and sport teams are aware of the damage of floods on Cole Field.” As a community, we need to address the fact that our campus is under-resourced and energy inefficient; we need to ensure that in the future the College is more resilient. The town and College are intricately intertwined in climate resilience, and both Ansari and Muñoz stressed the importance of student voices at town meetings. “We need to know who sits on the Williamstown town boards; we need to know who is representing our concerns,” Ansari said. In the upcoming months, Williamstown will be updating its hazard mitigation plan concerning naturals disasters and weather events, and there will be public forums for discussion and debate.